Imagine if a professor of Semitic languages at a European university comes to the country’s Parliament to give a lecture to the Christian Democrats on minorities in northern Iraq. When he speaks of the Kurds, he says "Kurdistan", but when it comes to Assyria he calls it "Atra". How many MPs would understand the word Atra? A similar case has actually occurred in Holland. Our Assyrian leaders and activists must therefore refrain from rewriting the original toponym of their national homeland. I have often noticed that many Assyrian leaders and activists from Iraqi Assyria nowadays fail to call their occupied country by its real name. Instead, they use alternative terms, which Orwell would criticise as 'political language', like Atra or Beth-Nahren. Likewise, they name the Assyrian people as Bnay Amman (members of our people), Bnay umtan (members of our nation) or Amma diyyan (our people). Even Assyrian organisations in the Diaspora are using words such as The Homeland in their associations' activities. Recently I read such an advertisement for an Assyrian local association in the United States and wrote to the member who shared it on social media. She agreed with me that it is inappropriate to use the vague term "Assyrians in the homeland", but told me that there are those who insist on avoiding terms such as "A Walk for Assyria" in order not to offend members belonging to churches other than the Assyrian church of the East. The phenomenon of rewriting Assyria has also reached European Orientalists and experts. Mrs. Attiya Gamri, a former Dutch MP, recently brought one such example to my attention: a few years ago, Herman Teule, professor of Semitic languages, was invited to the Parliament in The Hague to lecture for the party Christen Unie on the situation of the minorities in northern Iraq. He mentioned several times the word "Kurdistan" but when it came to Assyria, he just said "Atra". Mrs. Gamri kindly asked him why he used an expression that no one in the congregation understood. He said that the Assyrians he had met in Iraq used to say “Atra”. So he assumed that the land which they described was called just Atra. Those who use these rewritings about their ethnic identity prefer to be politically correct in the ongoing name conflict and the divisions between Assyrians of different church affiliations. But the gist of such reasoning is that the Assyrian patriots, who value their ethnic Assyrian identity and nomenclature above their church affiliation, thus are bowing to the misconception that the name Ashuri (Assyrian) applies only to people from the Assyrian Church of the East. This propaganda has been touted by the Syrian Orthodox and Chaldean church leaders since the 1930s, after the Simele massacre, and still creates frictions within the Assyrian community. In order to reach a political consensus Assyrian organisations from time to time have tried to find a solution to the name issue by merging different names. After World War I, the term Ashur-Chaldo came in use when the Peace Conference would determine the future of the remnants of the Ottoman Empire. The Assyrians demanded an independent Assyria and submitted a map under the name "La Nation Assyro-Chaldéenne". It failed because the great powers were not interested and the Assyrian delegations were internally divided. After Saddam's fall in 2003, Assyrian political organisations and churches gathered to a meeting in Baghdad, organised by the Assyrian Democratic Movement (Zowaa). The meeting adopted the double name Chaldo-Ashur to be written into the new Iraqi constitution for the people "who spoke Syriac" (in Arabic: al-nateqin bi al-Lugha al-Suryaniyya). Shortly thereafter the unity was broken when the newly appointed Chaldean Patriarch Mar Emmanuel Delli refused to accept the compound term, which included Ashuri, to apply to his denomination. As a reaction, the East Assyrian bishop in Iraq Mar Giwargis Sliwa (now the Patriarch of the AssyrianChurch of the East) wrote a letter to the Constitution Committee and declared that he accepts nothing but Ashuri. The new constitution was adopted in 2005 where the Assyrians are classified as Assyrians and Chaldeans, i.e two different people, who speak Syriac. In February2016 the Syrian Orthodox Patriarch Mar Afrem II Karim, was on a visit to Baghdad. He met with the speaker of the Parliament and expressed the wish that the Syrian Orthodox too should be included in the Iraqi constitution, written as Suryani in par with Assyrian and Chaldeans. If this occurs, the Assyrian people will be constitutional classified under their denominational churches and affiliations. This is what the Kurdish president Massoud Barzani aspires for. Ten years ago he brought Sarkis Aghajan, an Assyrian member of the KDP – a party founded by Massoud's father Mustafa Barzani, to play a central role. Aghajan was presented as a counterweight to well-known Assyrian leaders who had been elected to the political assemblies through legitimate and genuine Assyrian voters. Barzani has a great interest in Assyrian matters because he is occupying their country and would like to assimilate them into a manufactured Kurdistani identity, where they are eventually reduced to mere Kurdish Christians. Therefore, he went into the game to gain a greater grasp of Assyrian politics. He made sure Aghajan was honoured with medals by all Assyrian Patriarchs. Even the Pope and other Christian leaders gave Aghajan medals. In 2006, Aghajan gathered overall Assyrian organisations to a meeting in Arbil where a new party alliance were formed. They also adopted a new name by merging the triple designation ChaldeanSyriacAssyrian. These three names represent the three largest Assyrian churches with same names in Iraq, ranked by size. TV channels, some funded by Barazani, which had spread widely among the Assyrians were paid to market the new triple designation. Since then the politically correct Assyrian representatives are using this combined name even outside of the context of Iraq. The triple name is thus fully inline with Barzani's desire to present the Assyrians as "Christian citizens of Kurdistan" and by extension "Christian Kurds". From his point of view, it is nonetheless an understandable tactic, but from the Assyrian organisations’ side it is a sign of weakness against the de facto power. For a few years, Zowaa and ADO admittedly remained faithful to the compound Chaldo-Ashur term, but then yielded to the triple name, on the grounds that they do not want to stand in the way of Assyrian unity. However, we have not seen any noteworthy unity developing from this yet. The development of the name issue, however, has taken a new wrong turn when some Assyrian leaders are solely using the term "Christians" when they want to avoid their people's genuine ethnic term. However, the term "Christian" faces criticism by many Assyrian patriots who see their ethnicity eroding and fear that it promotes Barzani's assimilation policy. The Assyrians are proud of their Christianity, but they are not just Christians. They have national and territorial rights in their own country to defend. Whatever the reasons are for the renaming of Assyriaand Assyrians, the Assyrian National movement must speak out and call their occupied country by its real name. When, for example, some Swedish-Assyrian politicians use the name Bethnahrin in their speeches in Swedish, it is equally incomprehensible to the Swedish audience just as when the Dutch parliamentarians' confusion the term 'Atra'. We must not be ashamed in saying: we certainly do not have a recognised Assyrian state, but own a historic area that is occupied, named Assyria. The astute reader will may criticise our argument, by saying: but the pioneers of our Assyrian national movement both wrote and sang about Bethnahrin (Mesopotamia). It is true, that is what we also have done for decades. 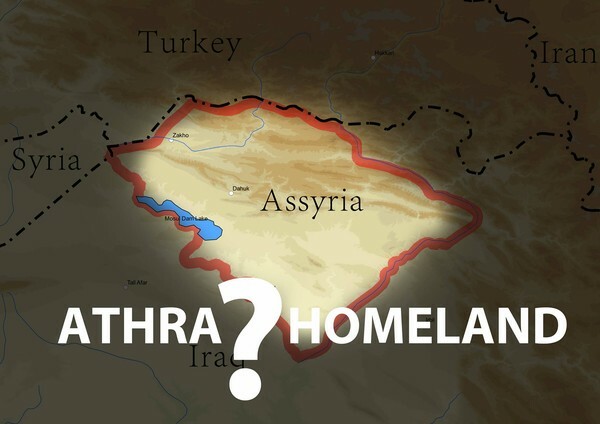 But the conditions for using the indigenous name Bethnahrin have changed, now even the Kurdish occupiers of 'Bethnahrin' are claiming Mesopotamia, as their own; both as a geographical area and a toponym. Our pioneers wanted to use the neutral name Bethnahrin to unify a nation split by sectarian schisms, at a time when the Assyrians still populated the Assyrian heartland in upper Mesopotamia. But now the indigenous Assyrians are on the edge of extinction from their homeland. Therefore it is more important to mark our ethnicity by our own country Assyria. It automatically includes the national rights of such an ethnic group. If we as Assyrians accept to be solely called "Christians", these rights will not be obvious under international law. In such a case, we may accept the fact that the state where Assyrians are living guarantees us nothing but civil rights -at best.